It’s been a heady time these last few years and not too shy on the drama front. But as life has settled into something approaching normality, it’s been more difficult than ever motivating myself to break the blog silence. But if you will bear with me as I remember how to write, I will start with a story about friendships and the passage of time. 2 years ago this week was the rarest set of circumstances. I had just found out my beautiful mate, Kate had relapsed and was desperately ill again. I had just started going out with the man who was to become my gorgeous husband. I was sitting looking overlooking the Mediterranean with a generous G&T on my annual holiday with my best mate Jen and our children and pondering the above. And I was also, unbeknown to anyone including myself, relapsing again. And there began our friendship with Reinhold and his wife Martina, with Reiny, as he is known, desperate to learn the idiosyncrasies of the English language and presuming Jen and I looked the best culprits to teach him. Fast forward 2 years and Jenny has just returned from a long weekend in Donzdorf with Reiny and Martina having been a much better friend than I, keeping up with their regular emails, skypes and personalised boxes of presents including rather uniquely once, a carnival in a box complete with noses and piles of confetti… Whereas my lazier part of the bargain was to teach Reiny English through my blog to which I unreservedly apologise for playing fast and loose with apostrophes and analogies and causing anyone with the slightest need to follow a linear progression, whip lash. If you don’t believe me, check out this review of my book from the international audience on Amazon (especially the comment about perplexing verb tense and occasional lack of linearity). Feel a bit boasty about this but it did follow a 3 star review so that makes me feel a bit better! But as ever, I digress. As Jenny (the very good but eccentric friend ) left Germany feeling discombobulated and rearranging it’s autobahns back into nice straight lines again, Reiny pressed a big pile of English notes into her hands to give to the charity of my choice, which of course is Bowel Cancer UK. And so I want to send a massive thank you to two people who have touched me with their compassion and humanity. Not to mention their patience and loyalty. That’s you Reiny & Martina in case you wondered. Last weekend was also a happy bittersweet occasion and testament to the healing power of friendships. Kate’s daughter Bea and my daughter Lois have become friends through some of the toughest experiences imaginable. 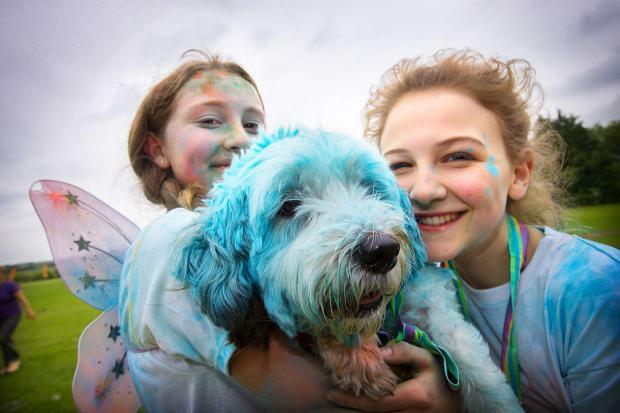 And last weekend they gave back their time and energies for another charity, the Helen & Douglas House in the rainbow run. I couldn’t be more proud of them. I have been so lucky to be surrounded by people like this. People who hold up a mirror of humanity to the World. And so as I sit here in my little home office looking out onto the street (or curtain twitching as my cousin called it) I can’t quite believe how lucky I am to have meet and known, properly known and terribly missed, my mate Kate and now her daughter Bea, my long serving loving dotty mate Jen and our new friends Reiny & Martina and of course my darling John. Amongst many others, too numerous to mention here. Now go and have yourselves a nice weekend and I promise to write soon when mega scan (2 years can you believe) is over and done in a month or so.